BlackBerry released a new version of its flagship Passport smartphone. 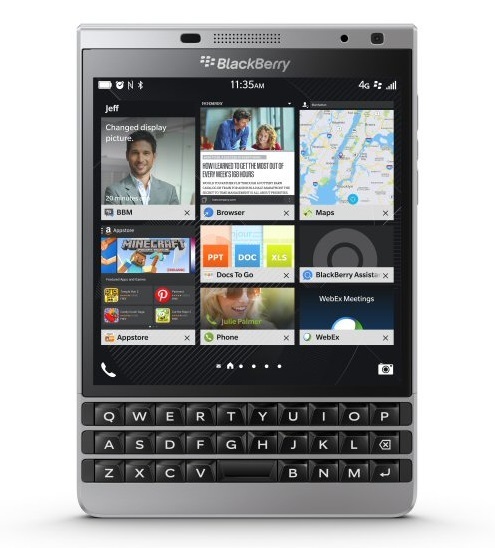 It is called the BlackBerry Passport Silver Edition. By its name, one can tell that its color is silver. It will also come with a stainless steel frame for extra strength and durability. Its keyboard has been improved and its corners are now rounded. Moreover, a diamond weave pattern can be seen on the back for improved grip. Aside from the above mentioned changes, the BlackBerry Passport Silver Edition will have the same specs and features as the original Passport. So it will also feature a 4.5-inch 1,440 x 1,440 IPS LCD with Gorilla Glass 3 protection, Qualcomm Snapdragon 801 SoC with 3GB RAM and 32GB of expandable internal storage. It will also have a 13-MP rear camera with optical image stabilization (OIS) and an LED flash. There is also a 2-MP front-facing camera on board. Connectivity-wise, it features Wi-Fi, Bluetooth, GPS, NFC, and LTE. A 3,450 mAh battery will keep its lights on. The new Silver Edition runs BlackBerry OS 10.3.2 and will be able to play Android Apps from the Amazon Appstore. It will cost $549 unlocked and for a limited time, you will also get some free accessories (Flip Case, Flex Shell and Sync Pod) with it worth $130. It will be available in the US, Canada, UK, France, Germany, Italy, Spain, and the Netherlands.